Spray 3 1/2- to 4-quart slow cooker with cooking spray. In slow cooker, place carrots; sprinkle with salt, brown sugar and butter. Cover; cook on High heat setting 4 to 5 hours, stirring after 2 hours, or until carrots are desired tenderness. Spoon carrots into serving bowl; spoon any sauce from slow cooker over carrots. Season with additional salt and pepper, if desired. Stir before serving. Sprinkle with parsley. Add 1 medium onion, cut into wedges, with the carrots. 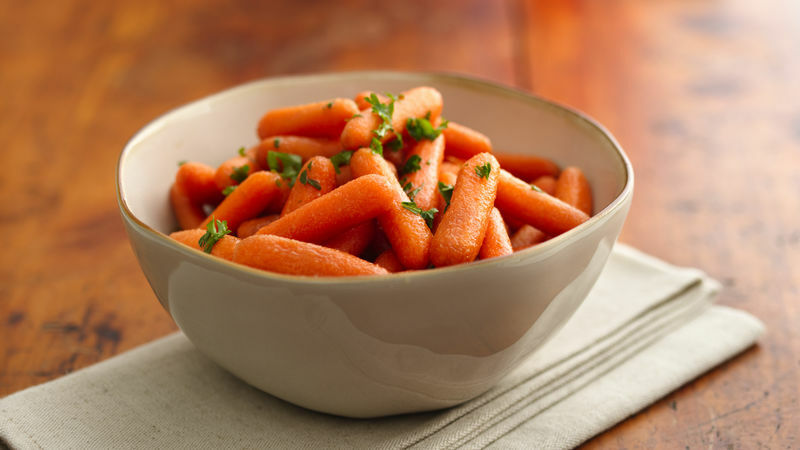 Carrots can be held on Low heat setting up to 1 hour. Now introducing: your new favorite side dish. These slow-cooker carrots simmer in a brown sugar mixture for 4 to 5 hours giving them a sweet, buttery flavor that pairs perfectly with a variety of main dishes like ham, turkey or beef. Carrots are also highly nutritious. They are a great source of beta-carotene, fiber, vitamin K, potassium and antioxidants, and have also been linked to lower cholesterol levels, weight loss and improved eye health. Carrots get their orange color from the presence of beta-carotene, but carrots can also be found in yellow, white, red and purple colors. We have even more ways to include vegetables in your meals from sheet-pan meals, to veggie pizza. Browse our vegetable recipes and you’ll never avoid eating your veggies again (they’re that good! ).